Are you looking for eye-catching designs? 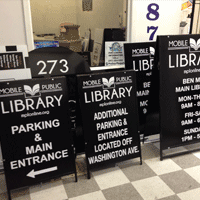 Sign Pro is your ultimate resource for creative solutions you can depend on. We pride ourselves on being a service-oriented company that delivers high quality products. We are able and eager to undertake almost any project that comes our way. Our goal is not just to make signs, but to make signs that make you money! Need a quick, inexpensive sign to get your message across? Then you probably need a banner. Sign Pro offers high quality banner products for all occasions and uses at fantastically competitive prices. Our custom-made banners are perfect promotional tools for events like grand openings, anniversaries, ceremonies, point-of-purchase graphics, sporting events, sales, celebrations and more. 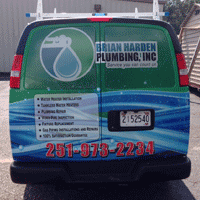 Vehicle graphics are far more cost-effective than print or broadcast media. It's a popular advertising method that many business types such as contractors, plumbers, electricians, landscapers, painters, caterers, restaurants, computer/IT professionals and numerous others benefit from. We can wrap just about anything from vehicles to refrigerators to golf carts and anything with a smooth surface. Sign Pro creates interior signs ranging from office door signs, directories, ADA compliant signs, way finding signs to wall-mounted logos. We are experts at creating a professional and functional office space that will impress any client. In today’s competitive business world, a sign serves as much more than just a simple identification medium. As one of the first things a customer will probably see, a sign is a key marketing tool that must effectively communicate intentional and positive brand messaging. 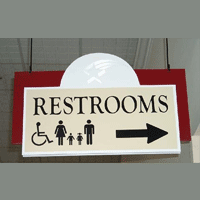 We design exterior signs that can be made of wood, metal, foam, plastic, acrylic, etc. Our focus is to create high impact signs that help achieve your purpose. Need to make a positive impression or display an important message as people enter your facility? Window Graphics may be the perfect solution for you. 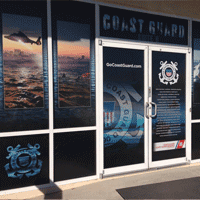 Custom window graphics can be done in a variety of colors and styles to coordinate and reinforce your business image or promote your latest products or special events. Generate leads and stir the interest of your existing customer base. Preparing for a tent sale, golf tournament, or some other event? 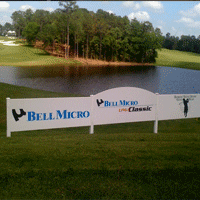 Let Sign Pro promote your next event with our custom signage. We specialize in athletic events, sponsorship's, athletic facility and image branding. 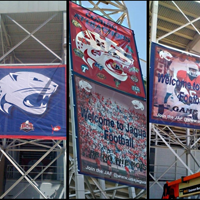 Sign Pros impressive and growing list of events and customers that we have recently provided services to include the Senior Bowl, University of South Alabama, The LPGA, The National Football League, Under Armour, Reese's, and many more. Three-dimensional letters create a distinctive and eye-catching look on any surface. In fact, exterior three-dimensional lettering can help make your business stand out for those driving by your location by creating boosted visibility. Three-dimensional letters also can also be used for interior signage. Our lettering types include bronze, metal, acrylic, foam and plastic letters. 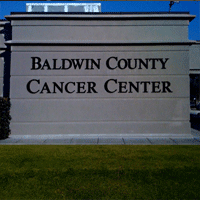 We can turn your logo into an impressive dimensional sign for either the interior or exterior of your office. For examples of our work, please visit our Sign Gallery.